Richard Neutra founded this firm in 1926 while he was still living in the Schindler House. Shortly thereafter, came the birth of his second son, Dion. At about this time, he was working on his first major project the Jardinette Apartments (1927) in Hollywood. A couple of years later, the Lovell Health House (1929). After a distinguished 40 years, he invited his architect son in as partner and vice president in 1965. Dion has carried on the firm since his father’s death in 1970. In 2012, we marked Richard Neutra’s 120th birthday with the first ‘Running’. That Earth Day, April 22 we marked 42 years since the first Earth Day was celebrated on April 22, 1970, just a week after Neutra’s death. He would have been so proud! 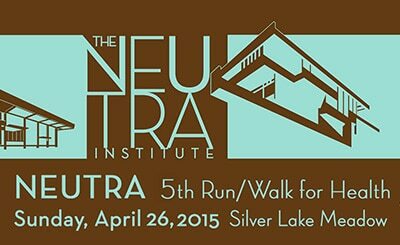 In the aftermath of our fledgling day of events, of Earth Day 2012, the Institute is looking ahead to continue to sponsor ‘Neutra run-walks for HEALTH’ on the Sundays closest to Earth Day each year, so we’re taking orders NOW. Please do calendar this day now and plan to join us? Note that even if you are unable to attend in person, you can support our efforts virtually! Click on the first button below! Our select group of participants were uniformly enthused about our last effort at this! The City came thru with its proclamation of ‘Neutra Institute Day in LA’! We hope, this next time, to be much more aggressive in our outreach and enlisting of sponsorships etc. We learned a lot! Your participation and/or purchase of any combination of the events of this upcoming event, aggregating $50 or more, will entitle you to a year’s membership in the Institute. When: Sunday, April 26th, post Earth Day 2015! Included in Fee: Neutra Run-Walk for Health, Commemorative T-shirt in your size!, entry to Award and Closing ceremony. We need at least 75 volunteers for the event for various parts of that day and into the evening. Use the email link below to send your resume if you have one, to the Institute, specifying how much time you can contribute. If you’re limited to morning, afternoon, or evening, specify that so we can organize and get back to you. Click this information to: carlaris13@aol.com; Email: Dion Neutra for more information.